The government is doing its best to revive the country's university system which had been deteriorating, at a time when Sri Lanka has launched a massive development programme. President Mahinda Rajapaksa is dedicated to launch overall development and today the whole nation is enjoying its dividends irrespective of discrimination, said Higher Education Minister S B Dissanayake. 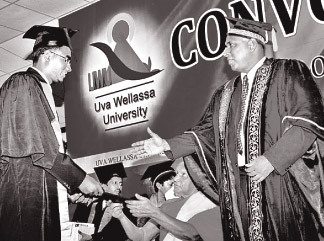 The 2nd Convocation of the Uva-Wellassa University was held recently. Higher Education Minister S B Dissanayake was the chief guest. Here, S L Rizwan from Addalachchenai who graduated in B.Tech in Science and Technology (Specialized in Food Engineering and Bioprocess technology) being awarded the certificate by Chancellor Ven Dr Aluthwewa Soratha Nayaka thera. Vice Chancellor Prof Ranjith Premalal de Silva looks on. Picture By Haliela TKN corresspondent. He said so addressing the graduates, undergraduates and the university staff of the Uva-Wellassa University at its second convocation. One hundred and seventy one students were awarded degrees. The minister said there was opposition against the establishment of private universities and higher education institutes in the country. A small group is responsible for these baseless schemes to gain political ends, he said. “They should realize that the establishment of international university branches would enhance the higher education opportunities for our children. Those who fail to enter state universities would get admission to them. “There would be scholarships for our students at these foreign universities and their activities would be closely monitored and regulated by the government,” the Higher Education Minister stressed. He said university students are expected to work hard for the development of the country at professional level. “The 30 years of terrorism is over. Now the development era has emerged and we shall be in the forefront of gaining new dimensions in science, information technology, computer education, languages, management administration etc. “We are now introducing reforms to our universities to face this challenge. Thus, you are obliged to use your leadership skills and innovative capacities for the country's development,” Minister Dissanayake added. The Uva-Wellassa University was established as a national university in 2005. It was designed to provide essential skills while upgrading conceptual and methodological background and training required to obtain practical solutions for value addition in the local agricultural and mineral resources of the country. The 171 graduates who passed out were attached to the Faculties of Animal and Export Agriculture, Management, and Science and Technology. Five students of the batch who had excelled in their degree programmes were awarded felicitations by the minister. Chancellor Ven Dr Aluthwewa Soratha thera and Vice Chancellor Prof Ranjith Premalal de Silva also participated.